Pleurodesis is a surgical procedure used as a palliative treatment for pleural mesothelioma. Pleurodesis is used to address pleural effusion. Pleurodesis can help alleviate several pleural mesothelioma symptoms. As a palliative treatment, this surgery cannot improve life expectancy. Pleurodesis has many benefits, but also poses potential risks. Pleural effusion is a common symptom of malignant pleural mesothelioma, caused by fluid buildup between layers of the pleura. This can cause an array of bothersome symptoms, causing patients to seek treatment. Pleurodesis is a palliative treatment used to treat pleural effusion, and often a common component of malignant mesothelioma treatment plans. Pleurodesis is a surgical procedure that removes this excess fluid, therefore helping to improve breathing and alleviate other symptoms. As a palliative procedure, pleurodesis does not improve survival rate and is solely meant to improve quality of life. After pleural mesothelioma patients present symptoms to their physician, imaging tests are often done; pleural effusion can be seen on scans such as a chest X-ray or CT scan. 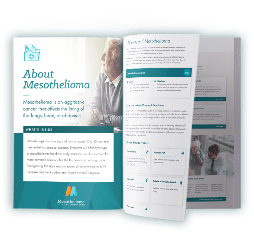 When effusion is detected and symptoms have escalated to a point of causing severe breathing difficulties, mesothelioma specialists will likely choose to do a pleurodesis. If the patient is in the late stages of their mesothelioma diagnosis, patients may not qualify. There are different types of pleurodesis, including chemical pleurodesis, mechanical pleurodesis (otherwise known as surgical pleurodesis) and rapid pleurodesis. Experts continue to explore the effectiveness of these procedures through clinical trials in treating mesothelioma, congestive heart failure and other lung diseases. After anesthesia administration, a needle is inserted into the chest, using a drainage tube to drain pleural fluid. After drainage, a treatment agent is inserted between the lung and chest wall, typically talc, Bleomycin, Tetracycline or Doxycycline, and the patient must wait and shift positions until the area is completely sealed. The entire process may take a couple of hours, and pain medication is usually given to combat any pain and discomfort. Less invasive than other forms of pleurodesis procedures and often less expensive, chemical pleurodesis is common. Every case of malignant mesothelioma is different and a chemical pleurodesis procedure might not be a viable option for some, in which case surgeons may perform a surgical pleurodesis. This surgery is more invasive, but studies have shown success in treating pleural mesothelioma symptoms. Instead of using a chemical, the mechanical pleurodesis procedure uses gauze, a rough pad or other abrasive surface to cause irritation/inflammation and seal the pleural space closed. The invasive surgical pleurodesis and chemical pleurodesis can require lengthy hospital stays. In an effort to reduce a patient’s inpatient stay, physicians may recommend a rapid pleurodesis, which combines thoracoscopic chemical pleurodesis with a catheter. One study that analyzed the hospital stay difference between chemical and rapid pleurodesis procedures found a median hospital stay of 10 days for those using solely chemical, and 2 for those utilizing a catheter through a rapid procedure. After undergoing a pleurodesis, patients may face side effects like a fever, pain or soreness. Doctors may provide pain medication, but anti-inflammatory drugs, such as Ibuprofen, are avoided as they may interfere with fusion of the pleural layers. As with any mesothelioma surgery, pleurodesis has risks and potential complications that must be addressed prior to surgery, especially for patients of poor health. However, the surgery can also offer many benefits to patients suffering from mesothelioma symptoms. Pleurodesis palliative care isn’t a treatment option for all mesothelioma patients and must be discussed with their medical care team. While there are risks involved with the surgery, oftentimes the benefits outweigh the potential complications, offering an improvement in symptoms and better quality of life. 1 Fitzgerald DB, Koegelenberg CFN, Yasufuku K, et al. Surgical and non-surgical management of malignant pleural effusions. Expert Review of Respiratory Medicine. November 7, 2017;12(1):15-26. doi:10.1080/17476348.2018.1398085. 2 Fysh ETH, Tan SZ, Read CA, et al. Pleurodesis outcome in malignant pleural mesothelioma. Thorax. 2013;68:594-596. doi:10.1136/thoraxjnl-2012-203043. 3 Krochmal R, Reddy C, Yarmus L, et al. Patient evaluation for rapid pleurodesis of malignant pleural effusions. Journal of Thoracic Diseases. September 8, 2016;8(9):2538-2543. doi:10.21037/jtd.2016.08.55. 4 Mercer RM, Hassan M and Rahman NM. The role of pleurodesis in respiratory diseases. Expert Review of Respiratory Medicine. January 15, 2018;12(4):323-334. doi:10.1080/17476348.2018.1445971. Page last modified on September 6, 2018.